Sales of the 6.2-inch Galaxy S8 Plus are expected to beat that of the 5.8-inch Galaxy S8, a report showed Monday, reflecting the market's demand for smartphones with wider displays. Samsung Electronics Co. kicked off official sales of the new flagship smartphone series in South Korea and the United States last week. 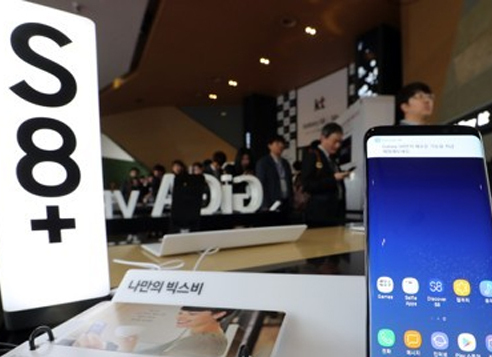 According to the report released by Yuanta Securities Korea Co., the annual sales of the Galaxy S8 smartphones are expected to reach 50.4 million units, with the Galaxy S8 Plus taking up 53.9 percent, or 27.1 million units. Samsung released two versions of the Galaxy S8 Plus with 64GB and 128GB data capacities, while the smaller Galaxy S8 only comes in a 64GB model. Industry watchers said the rising demand for wider screens comes as more users enjoy mobile games or video content on smartphones. The release of the Samsung DeX, or Desktop Extension that allows users to utilize the Galaxy S8 smartphone like a personal computer by connecting it to a monitor and keyboard, also helped the sales of the larger model, especially the version with a 128GB data capacity, industry watchers added. Yuanta Securities said consumers have been preferring larger displays over traditional models for the previous Galaxy models as well. The edge version of the Galaxy S6 and S7 accounted for 51.3 percent and 51.9 percent of combined sales, the brokerage house said. Taking such factors into consideration, Samsung adopted edge displays for both the Galaxy S8 and the Galaxy S8 Plus. The increasing sales of larger models is also set to lend support to Samsung's earnings as such devices boast higher profitability, industry watchers said.